With a strong conviction to transform the country and prepare its people to cope with the growing challenges of the globalizing market, the Chinese government has actively increased more opportunities of higher education. The higher education system experienced a transformation from elite to mass form. The massification of higher education has provided more and more accesses to junior college and universities, and subsequently produced a growing number of college graduates looking for jobs in labor market. Similar to other East Asian countries/economies like South Korea, Taiwan, and Hong Kong, the strong impacts of China’s expansion of higher education on higher education admission and labor market are expected to appear. College students start to doubt the effect of higher education massification on bringing more equality in admission and improving their competitiveness in the job market. This, in turn, leads to a wide dissatisfaction of higher education development in China. 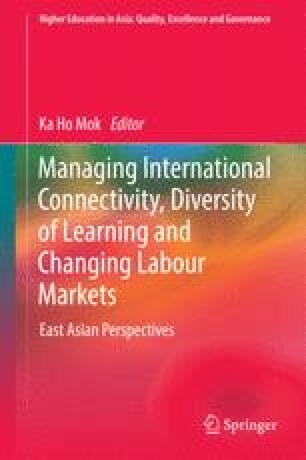 Realizing students coming from different family backgrounds may confront diverse experiences in higher education admission, graduate employment, and opportunity for upward social mobility, this chapter sets out against the policy context highlighted above to critically examine the impact of the massification of higher education on admissions and subsequently on graduate employment and social mobility in contemporary China. In the final section, this chapter also reflects upon reconstructing new education governance framework in promoting educational equality when higher education is massively expanded. Guo, M., & Wu, X. (2008). School expansion and educational stratification in China, 1981–2006. Paper presented at the conference of ISA Research Committee on Economy and Society (RC02), June 26–28, Switzerland. http://www.wjh.harvard.edu/~hos/papers/Maocan_Guo/Maocan_Guo.pdf. Accessed July 6, 2012. Ministry of Education of the People’s Republic of China. (1998). The action plan to education in the 21st century. http://www.moe.edu.cn/publicfiles/business/htmlfiles/moe/moe_177/200407/2487.html. Accessed April 20, 2015 (in Chinese).